Fanciers of the American Singer Canary hold that this canary is the ideal pet Canary. His personality and song have won the hearts of many Americans and is taking hold of hearts all over the world. The American Singer is a wonderful combination of song and beauty. If you are looking for a canary that offers both striking looks as well as beautiful song, the American Singer Canary will suit your needs. This wonderful breed has been selectively bred for generations to provide the perfect blend of song and beauty. The American Singer is a hybrid breed and is for this reason very prolific and hardy, which makes it more suitable for beginners than many other types of canaries. The average lifespan for American Singer Canaries is between seven and twelve years, with ten being the average. But they have known to live 22 years! Some American Singer Canaries may be quite aggressive. It has been reported that green colored birds may be more aggressive than other colors, though these may also be the better singers as well. As long as individuals are similar in temperament more than three may be kept in a large flight aviary. If one is particularly mellow, other American Singers in the same aviary may pick him on. 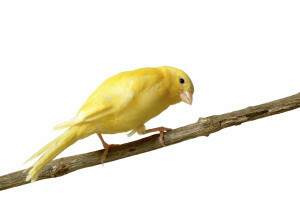 The American Singer Canary is an average sized canary with mature adults reaching 5 and 3/4 inches in length. They are seen in a wide spectrum of beautiful colors. 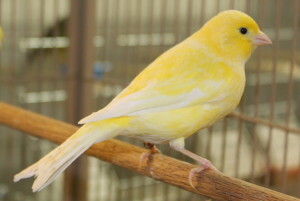 Clear yellow is typically the most popular among pet fanciers, and winning show birds typically possess plumage that is heavily variegated or green. All colors are allowed for both pet and show quality American Singer Canaries. Some other common colors of the American Singer Canary include bronze, orange, fawn, white, brown, buff, blue (grey), blue & white, green, cinnamon, fawn. They come in almost every color, but are never colorfed. In addition to their wide array of colors the American Singer Canary should also possess and equally broad array of Canary Songs. Because the American Singer has such diversity in his beautiful appearance and his lovely songs he is judge in both categories. This is unusual for a song canary as most are judged primarily on song. Song is, however, the primary judging section is their ability to produce their melodious songs. Songs are generally rated on a 100 point show score system. Originating in the United States, the American Singer Canary was first created in 1930. The canary breeds which were used to originate this marvelous breed are the German Rollar Canary (2/3) and the Border Canary (1/3). 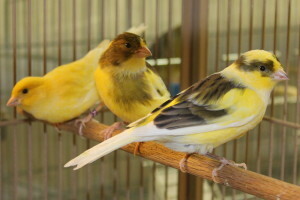 The Border Canary is a canary type bred primarily for his striking appearance while the smaller German Rollar Canary is bred for his soft beautiful song. By combing these two breeds the originators of the American Singer Canary produced a canary that has taken the best of both worlds. The American Singer Canary has an attractive size and a beautiful song repertoire that possesses a new song from other canary varieties. To be a Registered American Singer the bird must have on a closed band that was issued by the National American Singer Club. Canaries in general should be kept in large cages. they need to be able to fly. As with other pet birds perches should be kept clean to avoid foot problems. Besides a good mixed seed diet or pellets, all canaries need fresh vegetables to eat. Also a bit of fruit once in a while. If out of season molting occurs this is typically due to too much time in daylight in conjunction with constant temperatures over 75 degrees Fahrenheit.